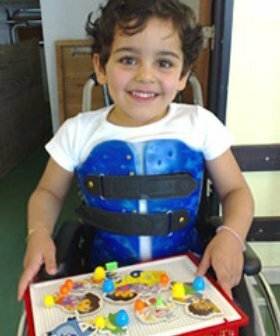 BRUSSELS — Samar Abed Rabbu, a four-year-old girl paralyzed by two Israeli bullets in her back, is a living testimony of the human tragedy caused by Israel's recent war on the Gaza Strip. "She has had two operations so far, one in Gaza and one here in Brussels," physiotherapist Pierre Van Lierde, Samar’s doctor, told the BBC on July 23 2009. "But the bullets are lodged too deeply. It's too dangerous to remove them and at least one of them is embedded in her spinal cord." 7 January 2009, the twelfth day of Israel’s onslaught against besieged Gaza, Israeli tanks were shelling the Jabaliya Refugee camp, northern Gaza. Khaled Abed Rabbu, his wife, son and 3 daughters, including Samar, lined up outside their home while his mother waved a white flag to the Israeli soldiers. Nonetheless, the Israeli troops opened fire at close range instantly killing two of the girls, Soad, 7, and Amel, 2. Two bullets hit Samar’s back, going into her spinal cord and paralyzing her from the waist-down. She was evacuated through Egypt and flown along with her mother to Belgium for an emergency surgery. Samar has since gone through months of grueling therapy and is desperate to walk again. But her Belgian doctors lament there is nothing they can do to repair her broken back. At least 437 of the 1,400 people killed by Israel in three weeks of land, air and sea attacks were children. Back in Gaza, Samar's family is still devastated. "It's been tough for all of us," said her father. "We are still coping with the trauma and the grief." Khaled spends what little money he has on phone calls to Brussels. "The family has been split for almost seven months," he says emotionally while looking at pictures of Samar taken at her Brussels hospital. Although he misses his little girl so much, Khaled does not her to come back to ravaged Gaza. "I miss my daughter terribly, I am desperate to see her again. But I don't want her to come back here - not to this." The Israeli war machine has wrecked havoc on the Gaza infrastructure, leaving nearly 20,000 homes and thousands of other buildings destroyed. Just like all other homes flattened by the Israeli juggernaut, Khaled’s is still in ruins. With the stifling Israeli blockade still in place, there is no concrete or steel to rebuild destroyed homes. "What can I offer her? She is much better where she is," said Khaled. His wife Kawthar, who is accompanying Samar in Brussels, also says that while missing her family, her girl would be better off in Europe. "I don't want to take her to Gaza because I don't want her to lose her mind like she lost her legs."